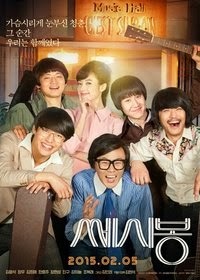 Set within the “C’est Si Bon” music hall in South Korea, movie follows the legendary music group “Twin Folio”. The story starts with groups early years with the members in their 20’s as they gain popularity and follows the love life of its muse. Music group “Twin Folio” was actually a duo, but in the film are portrayed as a trio. The group existed from the 1960’s through 1980’s and played folk music.